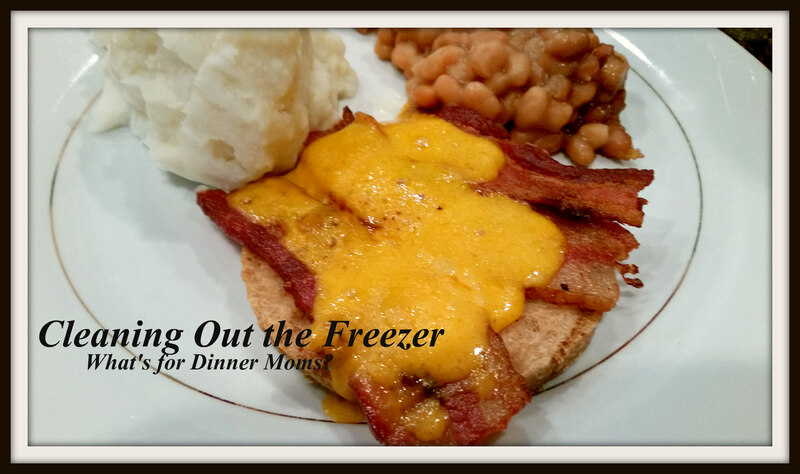 Cleaning Out the Freezer: Meals from the Bottom of the Freezer – What's for Dinner Moms? This has been a busy month. Lots of great things but just quite a bit of cash going out at once. I spent a week in hotels with my daughter for St. Patrick’s Day. Then this past weekend we headed to Madison, WI to celebrate the 50th birthday of a dear friend. We all arrived home sick but in the meantime a distant cousin died and my partner needed to head back to Wisconsin for the funeral. Another trip and another night in a hotel. When we got home and running the washing machine it ate our clothes. Literally. We have to call the repair person tomorrow. Ick. Then we are looking for a new car. Mine has 230,000+ miles and is a great car but it is time to make her a town car. I HATE buying cars. I like driving and looking at them, but the price thing? No. Just no. Generally I do a No Buy January and June. Which basically means that for those two months we eat from the freezer and pantry, only buying limited fresh produce and dairy. This year I skipped the No Buy January but I am kind of glad because I am hitting the No Buy March so that we don’t have to dip into savings accounts. I cut my grocery bills these months usually by about 75%. So, that means I am making things that are strange. So, no real recipe today just an explanation of what I am doing and as it gets closer to March 31st the stranger the meals may be. This is made from Vegan burgers, which are leftover from my son’s vegetarian phase. No one really liked these burgers but I couldn’t just throw them away so they have been sitting in the freezer. Time to use them up. We had two packages of bacon in the freezer and some sharp cheddar cheese in the refrigerator. I don’t know about your house but in ours if it has enough bacon and cheese on it or in it someone will eat it. I had two packages of the vegan burgers and by the end of dinner time all 8 were gone. Success! I need a month like this!! Honestly twice a year helps keep me from finding those those bags of “I think it was meat” in the bottom of the freezer and the can for beans with a use by date from before my children were born! This is really good, to use what you have in the house, I do that too. I make up recipes to use what I already have and with this technique we don’t throw food. Also we go to the store with a shopping list after I’ve searched what’s missing in the house. With a little bit of organization, you can save money and also, not throw food. Yes. We have lists taped to the freezer doors and pantry but there are those foods no one likes or wants that I have to figure out how to make them eat them. Like these vegan burgers. Cheese and Bacon make anything taste good! This week we are having a few meals made from things in the freezer to give it a clear out and some meals will be a mixture of individual portions. We are having 6 nations casserole, meatballs, mint and pea soup with stuffed pasta pieces so far this week…..
Hmmm, mint and pea soup…. Wow so busy and lots going on Marci! I love your sense of creativity and working things out. It is a great trait for sure! Always love your recipes! Thank you! Your words always make me smile! That’s a great idea. I keep a fully stocked pantry, with 3 months of supplies, and freezer so a whole month is not too bad for us. The vegan burger is hiding in there! We did this (on steroids) before our kitchen remodel began. It’s amazing how much food was in our house!! Thanks for sharing. Lol! I guess bacon covers a multitude of sins! Mmmmm oh my gosh it looks so good!! Bacon and cheese makes everything great!